Panasonic cordless phones consistently get some of the best review ratings on Amazon.com and elsewhere. I was at a Staples store one time, and the sales clerk said he used to work at Circuit City, where they used Panasonic phones on the floor, and "beat the heck" out of them. He said they just wouldn't break. He thought they were the best cordless phones. I've seen them in regular use in many other "Heavy Duty" commercial settings, too. The user interfaces also usually get high marks as being intuitive. They may not be perfect (what product is? ), but they certainly are among the best cordless phones on the market. models and can be very daunting. I have already done all that wading, and in the comparison table below, I have simplified all of the information into a summary of the differences among the Panasonic DECT 6.0 Plus phones (2010 models), which are the most current models, as differentiated by the "Plus" in the name. Using my comparison table below▼, you will be able to easily find the phone that has the features you want, so you'll end up with the best Panasonic Phone for you. You can then click the model numbers in the comparison table below to get the link to that phone on Amazon.com, which usually has the best prices around. When you're done choosing a phone, read my article about how to get the free landline phone service that I've personally used as my home phone for nearly 3 years. Just buy the hardware once, and that's the last fee you'll ever see. First, let's understand the Panasonic Cordless Phone Model numbers, and translate them from Panasonglish to English. 123 is the Product Family, 4 is the quantity of included handsets, and X indicates color. means it is Product Family 653, comes with 3 handsets, and is black. There are actually 32 active model numbers in the DECT 6.0 Plus line up. WOW, huh?! Most of those exist simply because Panasonic offers the same basic model with different quantities of included handsets, and thus they increment that last number in the model number to differentiate it. In reality, there are only 10 different basic models, or "Product Families" as I call them. In my comparison table below, each column is a Product Family. I list all the specific model numbers in the rows that indicate the quantity of included handsets. Click on those unique model numbers to link over to that exact phone on Amazon.com to check the current price, and add the ones you like to your shopping cart. You can also click on the features in blue text to see my explanation of what they are. Are you ready? Here we go!! The number buttons on the 403/405 handsets are physically larger than on the 651-653 phones. Regarding the base size differences, if you are not planning to wall mount the base, you may want to opt for the slightly smaller base of the 403/405 to save desk/table space. If you are planning to mount the main base on the wall, you may want to consider how the unit will look installed on the wall. The 403/405 base is flat and narrow, and will protrude straight off the wall like a flat, narrow shelf. The 651/653 base is larger, but it is angled, so it may appear to be lower profile even though it may not actually be. Overall, the 651/653 may have an nicer installed appearance, but of course that is a matter of personal taste. The 753 has lower standby battery life probably due to the bigger screen. Talk and charge times are the same as the others. The 657s have Amber backlights. Too bad...pretty phones, ugly screen color. The 401 and 402 phones have an older handset design with a smaller screen. Since they have the screens from the older Panasonic phones, they may also have older technology innards. I'm not sure, though. The "A" in the model numbers stands for "Accessory Handset" in Panasonglish. All of these handsets work with any of the current phone models I list above, except for the 658 family, which very specifically requires only the KX-TGA651B handset for the Bluetooth Link-To-Cell features (see my compatibility chart below, and read my "Warning About Compatibility With the 658 Phones" further below very carefully if you're about to buy a 658 phone). Other than compatibility with the 658 family, the only difference between the A401 and A651 handsets appears to be the size of the number keys. They number keys on the A401 handset are physically larger than on the A651. Otherwise, they have the same specs, and appear the same. The A750 handset is obviously intended to go with the phones in the 753 product family, as it has the bigger screen. However, the A401 and A615 handsets will also work with the 753 phones, but the A750 handset costs about the same, so if you like the bigger screen, and are willing to live with less standby battery time, go ahead and get it. If I were buying expansion handsets, I would buy the KX-TGA651B, simply because it is compatible with ALL of the phones, including the 658. I like future-proofing myself as long as the cost is reasonable. Who knows I might upgrade someday, and/or future models may all incorporate the Bluetooth, and I wouldn't want to have to re-buy handsets. New Panasonic phones sometimes remain compatible with old handsets (as long as they aren't too old), but if my handsets don't have Bluetooth menus, and my new future phone does, it simply won't work. ▼ Be careful of this one on the used market. Looks just like the A651, but it doesn't support the Bluetooth on the 658 system. This is the handset that comes in the box with the 651-657 phones. You often find them for sale on eBay, or in the used section on Amazon. There is a very subtle, but VERY important difference to note about the 658 family of phones with regard to expansion handsets being purchased separately. Long story short, ONLY the KX-TGA651B handset will support the Link-To-Cell features. Handsets that come in the box with the 651-657 phone systems will NOT support the Link-to-Cell features of the 658. Handsets that you generally find on eBay also do NOT since they are usually peoples' unwanted extra handsets from the 651-657 systems. As you see in the "Handset Type" 3rd row of my main comparison matrix above, the 658 family comes from the factory with the KX-TGA651 handsets, however the 651-657 phone sets come from the factory with the KX-TGA652 handsets. The KX-TGA651 handset has the menu features that support the Link-to-Cell features, but the KX-TGA652 handsets do not. This has been confirmed first hand by a reader who purchased a KX-TG6513B system just to get the extra handsets to use with his new KX-TG6582T, since the overall cost for all the handsets was cheaper. The extra handsets from the 651 system were model KX-TGA652B. He said that the handsets would register to his 658 base, and worked with regular calls, but did NOT ring when a cell call was received, and that he could not access any of the Link-to-Cell features since the handset menu is different. Panasonic appears to have created the KX-TGA652B as cost reduced versions so they can offer lower prices on the non-Bluetooth phones. So the moral of the story is don't buy a 651-657 system thinking that you can use the handsets with your 658 phone, and don't get KX-TGA652B handsets loose on eBay. The KX-TGA652B handsets might look the same as the KX-TGA651B, but you will NOT be able to use your 658's Link-to-Cell features at all. The last thing to note is that the handset that comes in the box with the 658 phones is a different color than the expansion handset. As noted in my comparison table, the 658 system comes with KX-TGA651T handset, while the expansion handset is KX-TGA651B. The B means plain Black, while the T means Titanium Black. If you look at the picture of the 658 system vs. the expansion handset, you'll see that the sides of the handsets are different colors. Using text-to-speech technology the caller's name is announced in between rings if name-and-number Caller ID information is available. Link-to-Cell, as all of your cell phone contacts can be imported over to the Panasonic system. The headset jack is a small 2.5mm jack that allows you to plug in a corded hands-free headset. This is the same size jack used for cell phone headsets. As noted in my comparison table, all current Panasonic models except the 401 and 402 families have a headset jack. In my house I use a headset with my phone all the time. I just clip the phone to my pocket, and I can talk and just keep going about whatever I was doing before. I find that the headband style, on-ear headsets are the best because you can quickly and easily put them on with one hand, and they are much more comfortable than in-ear headsets. I also prefer the single-ear headsets over stereo headsets since it leaves one ear open for me to hear what's going on around me; besides, who needs to hear a phone call in both ears? At only about $9 for a good single-ear, on-ear, headband style headset, it's a great useful bargain. Now, after so many years of talking on headsets, I simply hate having to actually hold a phone in my hand while I talk. I'm spoiled. Panasonic makes some ranging from ~$9 to ~$18. The two most current ones on Amazon are the KX-TCA60, and the KX-TCA430. They are both reversible, so you can wear them on either ear, they both have an adjustable boom microphone, and they both have a headband and 4ft-cord. Mute/Volume Controls: I have had many headsets over the years, I've found that I never use the mute/volume controls on the headphone, though. If I need to mute, or adjust incoming volume, I just do that directly on the phone handset (note that the 401 and 402 family of phones don't have a mute switch). Also, that in-line control, although light, is mounted on the cord, and it is still a mass that swings around more than a plain cord would. It sometimes swings the cord out which catches it on things, and actually makes the controller a disadvantage. Folding feature: I actually view this as a disadvantage. With my headset, I just hang the headband around the phone after I put it on the base. The phone keeps it from falling on the floor. Also, when I go to pick it up, since it is a solid headband that doesn't rotate to fold, I can easily put it on my head with one hand. I can leave the headset plugged into the phone, and when it rings, run over, pick up the headset with my right hand, and start putting it on as I pick up the phone with my left hand. Works well. I think a folding headset would be harder to manage since it adds a rotation axis to the headband. You'll also notice that the KX-TCA60 gets higher reviews than the KX-TCA430 on Amazon. People say the KX-TCA430 breaks after a short while. 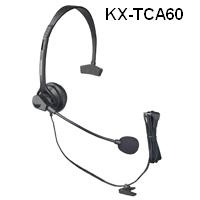 The KX-TCA60 costs $9 less, and gets higher reviews...even higher reviews than the Plantronics headband headsets. If you are a Plantronics fan, I would look at the M210C or the M214C. The Plantronics M210C is basically the same as the basic Panasonic KX-TCA60. No mute/volume, no folding, no noise-canceling. The Plantronics M214C is basically the same as the Panasonic KX-TCA430 and has the mute/volume, noise-canceling, but does not have the folding feature. I have not done a direct comparison of Panasonic vs. Plantronics headsets myself, however, I've owned a Plantronics M214C for the past 3+ years, and it has stood up to daily abuse, and still performs well. Plantronics are typically used by the pros who talk on phone all day like customer service and tech support reps. However, be aware that many Panasonic phone owners report that the Plantronics headsets do NOT work as well as the Panasonic headsets with Panasonic phones. Go check out the reviews on the Panasonic KX-TCA60 headset, and you'll see: here is a link to a pre-filtered search for "Plantronics" within those reviews. Take them with a grain of salt, though, since It is not always clear if those people are comparing to Plantronics headband headsets, or the smaller Plantronics in-ear headsets; the in-ear ones will never perform as well as a full headband headset mostly due to the shorter mic boom. Link up to 2 cell phones to the Panasonic 658 family of phones (KX-TG6582T or KX-TG6583T), and make and receive cell phone calls though your multi-handset Panasonic home phone. Be aware that although up to 2 cellular phones can be registered to the base, only one Bluetooth device (cellular phone or headset) can be connected to the base unit at a time. Link-to-Cell's Phonebook Transfer feature allows you to transfer up to 600 names and numbers from your cell phone phonebook to the built-in handset directory. Link-to-Cell also allows Bluetooth® headset connectivity for handsfree calls. You can handle a cellular call and a landline call at the same time. Either on separate handsets, or the same one. When another call is being received during a conversation, the interrupt tone sounds. You can answer the 2nd call while holding the 1st call on the same handset, or another person can pick up another handset to answer the other call. It's sort of like a 2 line phone, but the 2nd line is your cell. You can even set the Panasonic to use your cell's ringtone (if your cell supports it). Here's Panasonic's compatibility chart so you can see if your cell can connect to the system, however, just because it's not on the compatibility chart doesn't mean that your cell won't work. It might simply be that Panasonic didn't test your brand/model yet. When you want your cell to connect to the Panasonic, place your cell phone near the base unit. Not too close, though. Panasonic says that if the cellular phone is too close to the base unit during a cellular call, you may hear noise. For best performance, they recommend placing the cellular phone between 0.6 m to 3 m (2 feet to 10 feet) away from the base unit. I saw one reviewer say that it worked up to 25 ft, but I have not tested this myself. No Landline needed. This is a pretty cool idea. If you're one of those folks who have ditched their landline in favor of just a cell, just sync your cell(s) to the Panasonic, and you can make and receive cell calls from the multiple Panasonic handsets around your house like a regular home phone. More comfortable, and better battery life. Just put your cell down less near the base unit. If you plug your cell in, then you will be charging your battery while you talk on the Panasonic handset, and still be cordless. There is also a setting to reduce button pushes to make cell calls if you are not using a landline at all...it's in the manual on page 17. The Panasonic 658 family of phones is a good solution for those who have eliminated their landlines in favor of cell phones. However, be aware that I have also written an article about how to get free landline service. Here's a link to Panasonic's marketing video about Link-To-Cell. Allows the user to block unwanted calls by entering Caller ID info into the phone's call block memory. Assign a specific ring tone to a specific person in your phonebook. Program each handset to ring or not at your discretion. Make the bedroom handset silent, while the kitchen handset rings. 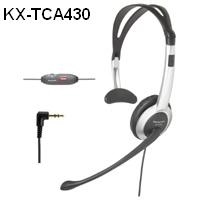 Included with the KX-TG4053B Model, or available for purchase separately here. Doubles the effective transmission distance between the base unit and the cordless handset. Gives the phone longer range. Works with ANY of the DECT 6.0 Plus phones listed on this page. While in a call, you can search your phone book and dial an additional number. Useful if you use calling cards, or want to program your voicemail password. When you get ready to buy, please use the links on this site to get to Amazon, and anything you buy during that shopping session will help me keep adding more info like this to help you in the future. Now that you've chosen a great Panasonic phone, you should think about getting a free landline. Yes, free. Well, free after you buy the hardware for it, which is only a one time charge. It's called Ooma. I've used it as my own home phone for 3 years. See my write up about it here.